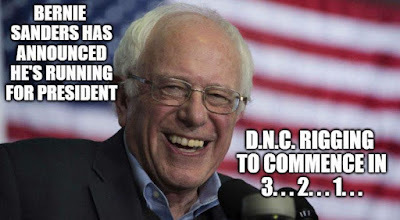 The Revolution Continues would be amiss not to mention that Senator Bernie Sanders has officially announced his candidacy for the office of president of the United States of America. 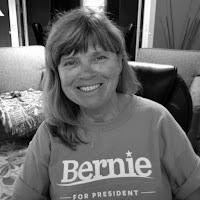 Since we are the original "Bernie Blog" (started a few months before a commercial site stole our name) we do keep an eye on the doings of the independent senator from Vermont. We've changed our name and transitioned since those exciting early days of following Bernie's campaign to covering the issues that effect everyone--from climate change to health care, from warfare to social justice concerns, from income inequality to student loan debt. Even so, we can't forget our roots. 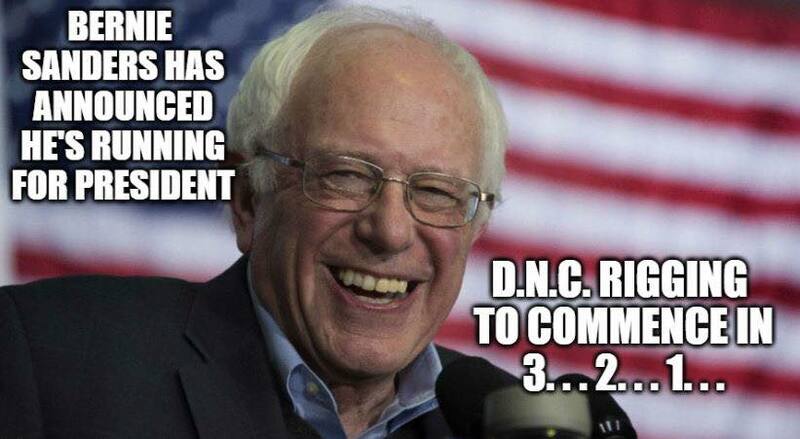 We wish Bernie well in his battle against the forces of darkness, that is, the corporate-owned-and-operated Democratic Party. We hope--and expect--to hear more from "Berners" in the near future. Please submit your blog posts via email at thebernieblog2016@gmail.com Remember, this is a workplace friendly blog and not an outlet for character assassination. You have Twitter and Facebook and other social media platforms for those kinds of things. We're looking for progressive insights and ideas that can be shared with human beings both here in the US and around the world. We hope to hear from you soon. 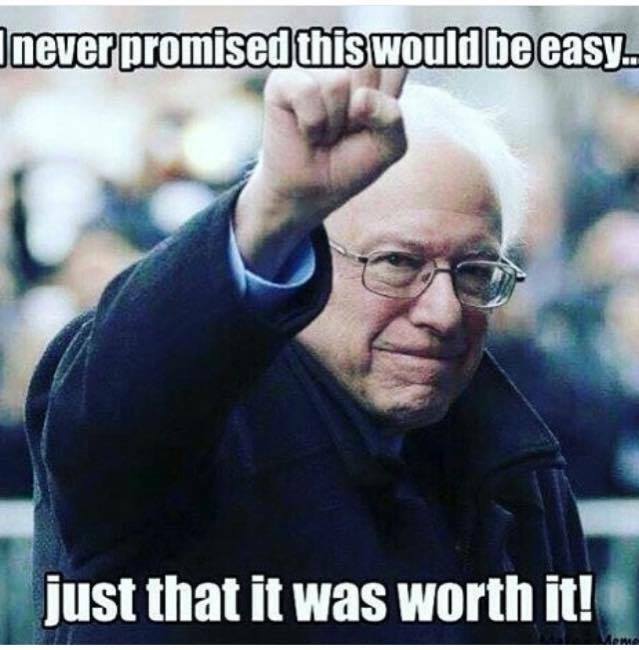 Until then, take care of yourselves and Feel the Bern. Always. 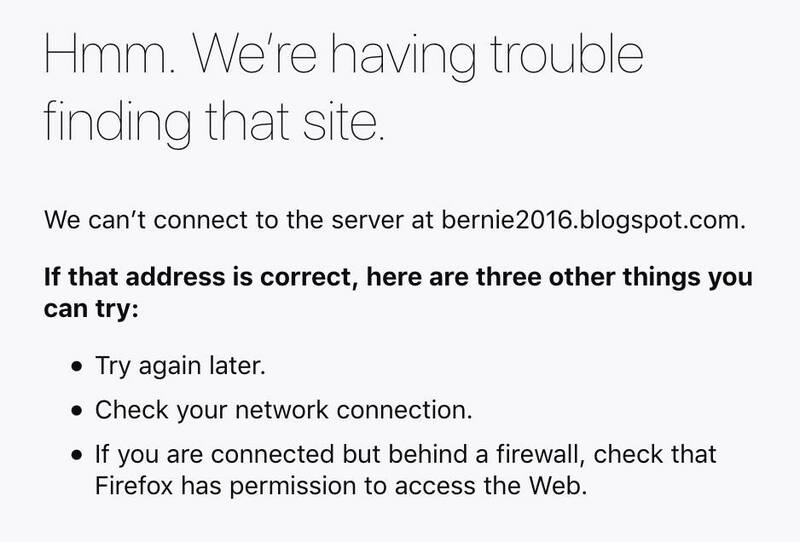 The powers-that-be and the haters of net neutrality have made it even more difficult to access this blog site. If you landed here in one piece, consider yourself fortunate. Do us a favor and share the blog link with others. 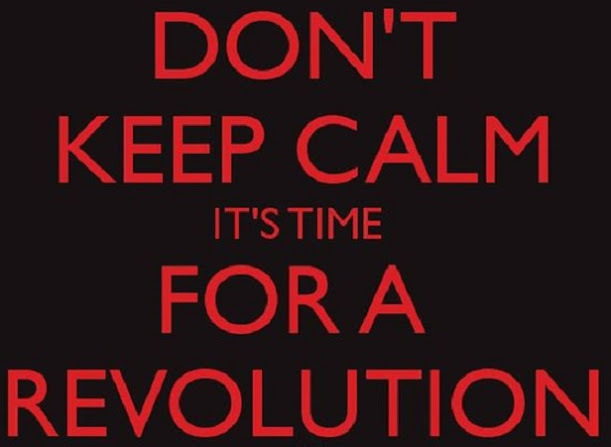 Better yet, share http://therevolutioncontinues.com with your friends and acquaintances on social media platforms. 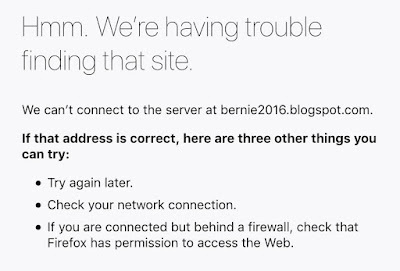 That URL doesn't seem to be blocked by firewalls--yet. 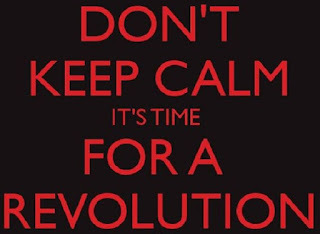 If you have any programming or web site experience and are willing to help The Revolution Continues find a better location on the internet to preach its progressive message, please contact us at the above email. Thank you. 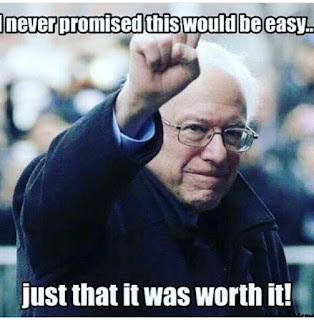 And now it's time to reflect on the toll that activism can take on a person fighting hard for that future to believe in that Bernie Sanders spoke so eloquently about in 2016. 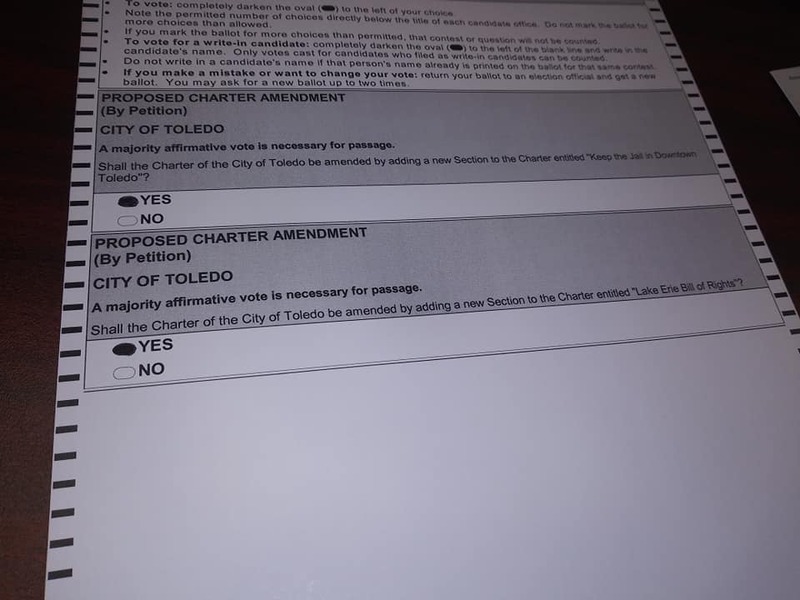 It's Special Election Day in Toledo. 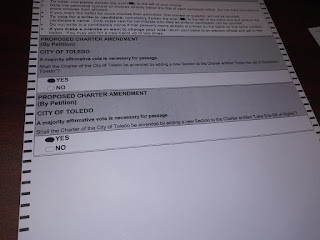 The results of this ballot to determine if the Lake Erie Bill of Rights has become part of the city charter won't be known for a few hours yet, so this is why this particular blog post isn't entitled "The Ballot." It's not the only reason, as you'll soon learn. 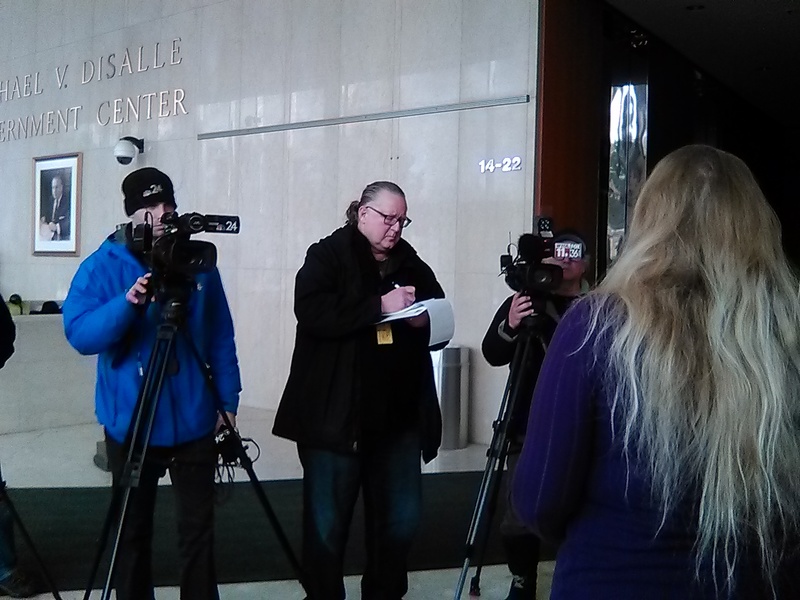 The Battle I'm referencing isn't the two year knockdown, dragged-out struggle to get LEBOR onto the ballot. It's not even a general reference to how difficult it is to be an activist in this day and age when most are content to keep their eyes glued to their phone screens and their minds entertained with state-produced propaganda while filling their bellies with GMOed junk food. It's related to both of these things, but it's more than that. Much more. The Battle is more than just activist burn-out or ennui. It's the battle we as human beings have with ourselves when we face a crisis in our existence on this plane and seriously consider the question, "Is it better for all the causes I hold dear to end it now?" Life isn't giving us any indications that all our hard work and prayers to build a better future are going to pan out. Do we continue to draw breath in hopes that the agony of facing The Battle will end some day? We are taught to serve and to work hard without complaint. We reason that perhaps it is simply ourselves who are defective when this impossible task strangles us. We view our meager efforts as getting in the way of others' success. It's selfish and cruel to thwart others' chance at a satisfactory ending. Why are we standing in their way of happiness? The Battle isn't something that comes and goes--it is constant and always lurking beneath the surface of many sunny faces. Too many. To those who have been blessed with the ability to always see the bright side of life, The Battle seems a distant fight, one that they're not particularly eager to enter into with their comrades-in-arms. "Focus on the task at hand and things will work themselves out," they'll lecture, even while knowing that things don't always work out, and there are potentially lethal consequences for not taking their friends' battles seriously. 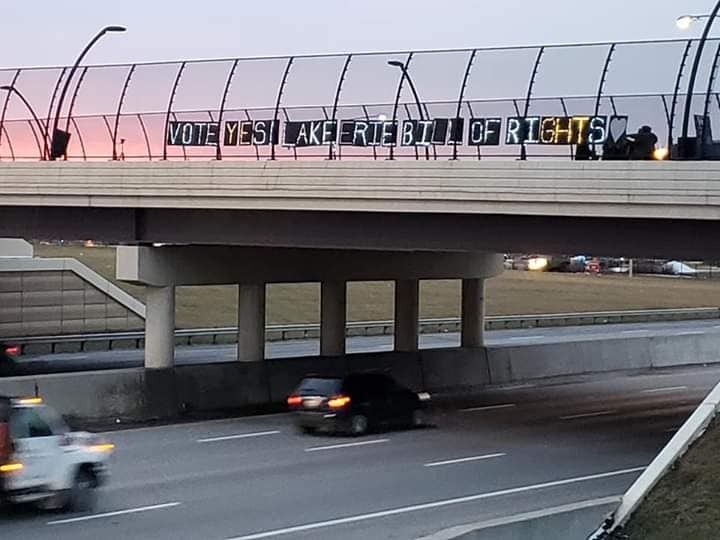 In 2019, the forces of darkness seem more real to activists than ever before. We can't afford to let up in our fights against fascism, racism, sexism, ageism, fill-in-the-blanks-ism. We need all hands on deck and all soldiers on the field. We're facing a world war of late-stage capitalism that steals the bread from the mouth of innocents and allows them to die without remorse. We're facing a sick society bent on preventing health care for millions in the United States of America while dropping bombs on millions more in the Middle East. We can't just stop the fight right now with so much at stake to take care of our own walking wounded, can we? But we can and we must. 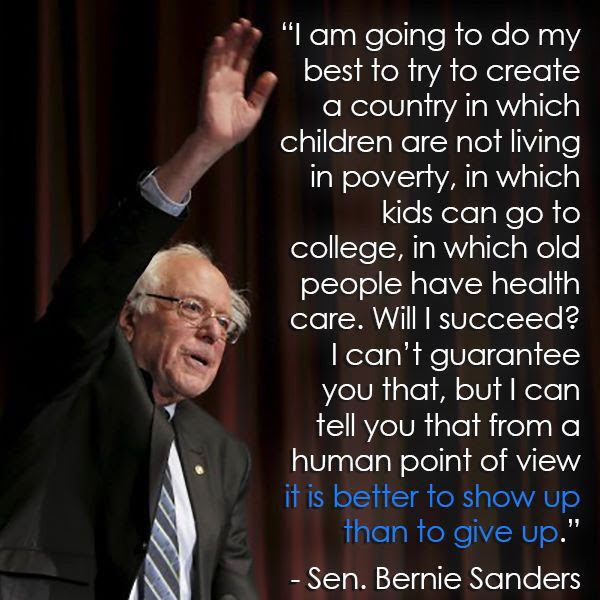 If we don't, then for what purpose do we labor to build a utopia for all to grow and thrive in? There will be blessed few to dwell in it. Please keep these thoughts in mind the next time you interact with your fellow activists. Tell them how much you appreciate their efforts. Better yet, show them how much you appreciate their efforts. 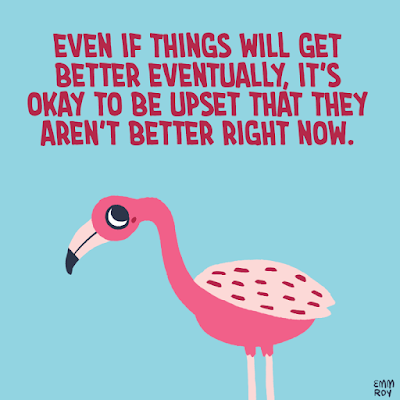 A hug, a kiss, a pat on the back, a dinner and a hot shower--demonstrate that you are glad they are still here, on this physical plane of existence, standing with you. Let them know that you are there for them in the same struggles, both on the streets and in the soul. It takes so little to be kind, and that kindness can be so beneficial. It can be the seed that grows and spreads the revolution of rising consciousness… that all human beings are to be simply loved and cherished, and even now the creation is anxiously waiting to blossom into the fullness of its purpose. The ballot boxes will always be with us, and those human beings who fight alongside us to protect our right to the ballot box should always take precedence over petty politics. Give each and every one of your comrades in the struggle the recognition and appreciation they deserve today! The Trump Administration could expose the Grand Canyon area to a massive increase in uranium mining. Opening this iconic landscape to mining would lead to its destruction. It would cause devastating water pollution. And it would increase the risk of cancer and other public health issues for local Indigenous communities. With the help of Friends of the Earth members like you, we’ve protected our public lands from the greed of the Trump Administration and fossil fuel industry. We need you with us again. Take action now: Tell your member of Congress to permanently ban uranium mining near the Grand Canyon! Since 2012, mining in the area near the Grand Canyon has been prohibited under a twenty year ban. However, the Trump Administration included uranium on a list of 35 minerals it considered ‘critical’ for national security, which could overrule the ban. Contaminated water from an abandoned uranium mine on the south rim is already poisoning a creek deep within the canyon, and another mine on the north rim, reopened in 2009, is housing more than two million gallons of contaminated groundwater. What’s more, recent water tests show that 15 springs and 5 wells within the Grand Canyon’s watershed contain dissolved uranium concentrations which exceed the standards for safe drinking water. But now, the Trump Administration could reverse the temporary 2012 uranium prohibitions. It is time for Congress to step in and stop any giveaway to the mining industry for the purpose of building more nuclear warheads and propping up the nuclear energy industry, at the expense of public health and the environment. We need your help to make the ban on uranium mining near the Grand Canyon permanent. Can we count on your support? Send your message: Tell Congress to protect the Grand Canyon from the mining industry! Trump’s vision for our environment is clear. He thinks our public lands are first and foremost meant to be exploited for the benefit of his coal, oil, and uranium industry friends. With the help of Friends of the Earth members like you, we’ve been leading the fight to keep fossil fuels in the ground on our public lands for years. With your support, we helped build a nationwide movement to preserve these places for future generations. We can’t let Trump hand over these places to the extractive industry. 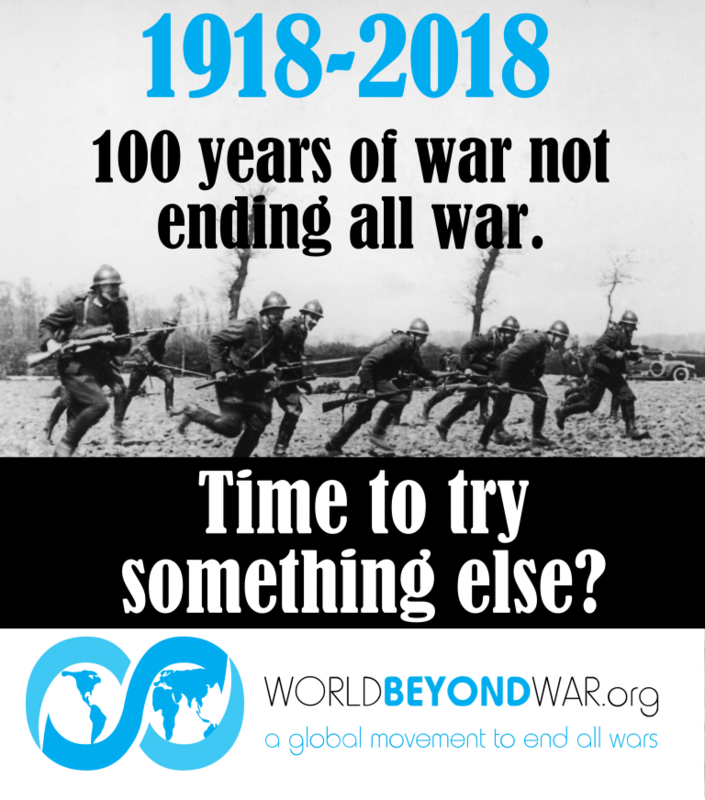 We need your help to fight back! Help send 40,000 comments: Tell Congress to defend the Grand Canyon from uranium mines. We will never give up fighting for net neutrality – and Republicans know it. When Trump's FCC repealed open internet rules, our movement filed lawsuits, pressured Congress and passed state net neutrality laws. Public support for net neutrality has only grown. So instead of trying to beat us, now they want to trick us. Three Republicans in the House of Representatives announced they will be introducing three so-called "net neutrality" bills. These bills would give telecom companies huge loopholes so they can continue discriminatory practices that are bad for consumers.1 Passing them could make it impossible for the FCC to enforce real net neutrality in the future. Fake net neutrality is not net neutrality. But Democrats could easily cave unless we speak up. Our elected officials need to hear that we won't accept anything less than the real open internet rules that Trump's FCC repealed. We need to kill these bills to make room for strong net neutrality legislation that actually protects the open internet for everyone. 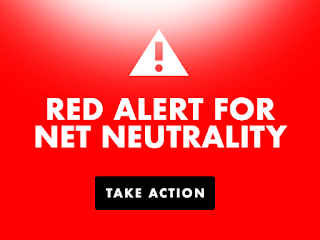 Tell Congress: Reject fake net neutrality. Click here to sign the petition. 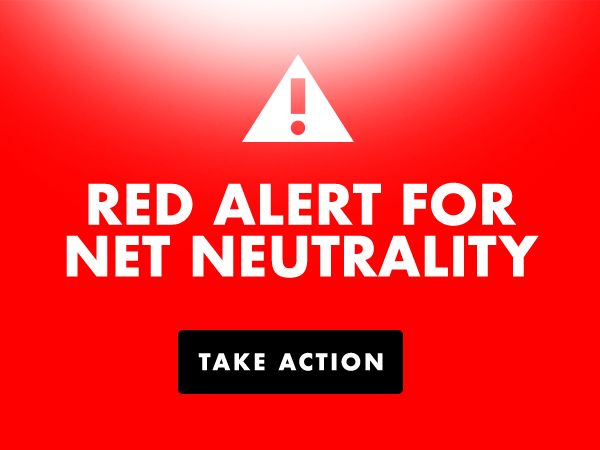 These bills aren't real net neutrality.2 Although they would prohibit certain kinds of anti-competitive practices by broadband providers, they won't restore all the rules we need to protect our rights online. Democrats in the House of Representatives have said they want a bipartisan net neutrality bill, which means they are open to compromising with Republicans.5 But we cannot compromise on the core principles that keep the internet open and free. Now that Democrats control the House, we have a real opportunity to push Congress to pass meaningful net neutrality legislation and direct the FCC to do its job. But if these bills gain momentum, we could lose that opportunity, maybe forever. Kieren McCarthy, "It's OK, everyone – Congress's smart-cookie Republicans have the answer to America's net neutrality quandary," The Register, Feb. 8, 2019. Klint Finley, "Republicans in Congress are talking net neutrality, at least," Wired, Feb. 7, 2019. John Eggerton, "GOP House Members Offer Trio of Net Neutrality Bills," Multichannel News, Feb. 7, 2019. 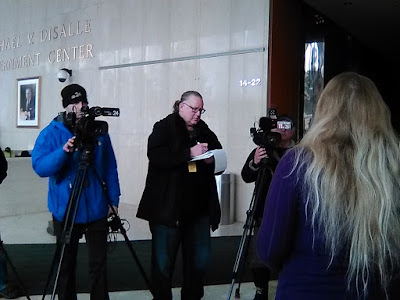 Shiva Stella, "Public Knowledge Opposes Net Neutrality Bills Weakening FCC’s Authority to Protect Consumers," Public Knowledge, Feb. 7, 2019. Harper Neidig, "House members hint at bipartisan net neutrality bill," The Hill, Feb. 7, 2019. 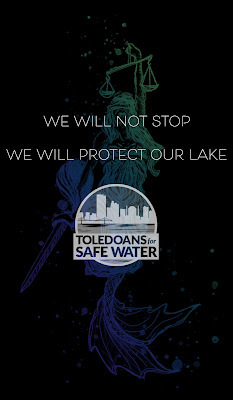 It's been a frustrating and an exhilarating week for the hardworking activists that make up Toledoans for Safe Water. (You can read what they've been doing lately on last's week blog, Our Children Are Paying Attention.) 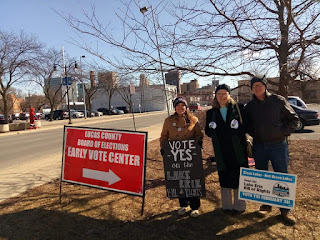 Their citizens' initiative to stop the blue-green algae blooms caused by the constant polluting of their city's drinking water supply by CAFOs and other industrial polluters finally gets onto the ballot and people are voting early in record numbers for a special election in the bitterly cold, snowy and icy month of February and then guess what? 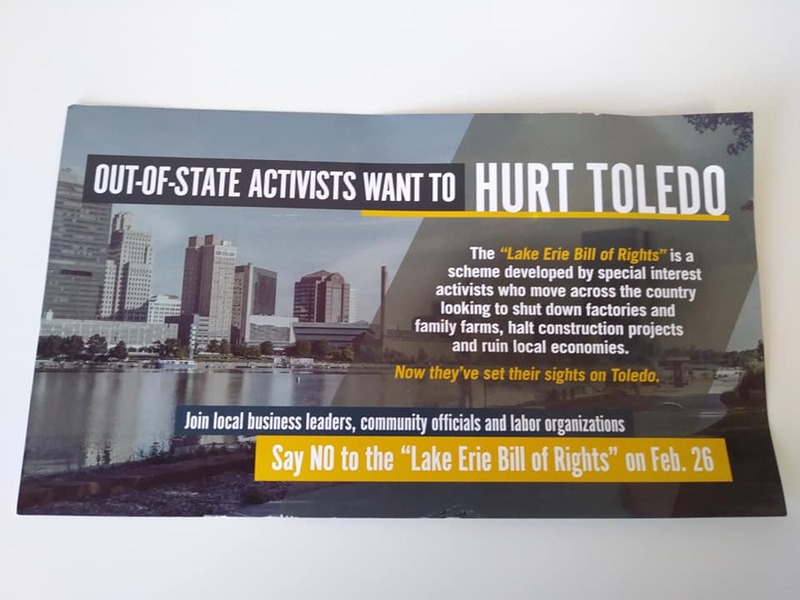 The opposition wakes up and starts a very negative and downright despicable radio ad campaign against the Lake Erie Bill of Rights (LEBOR) within the last two weeks of the campaign. A mysterious group formed only this past week, "Toledo Jobs and Growth Coalition" (which is actually a front for a PAC called Strategic Public Partners Group), is the creator of these very slick ads and negative text messaging. They insinuate that the Toledoans for Safe Water activists are all "out-of-state radical environmentalists," and one radio spot even went as far as to call them "extremists who want to poison your water." 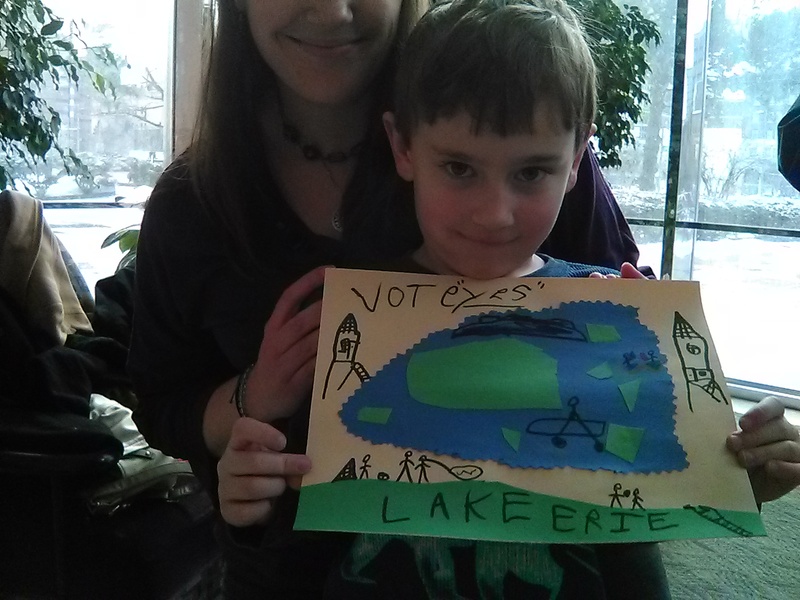 Another group, "Real Solutions for Lake Erie," has placed memes on Facebook featuring a stock photo of a mother and two young children cowering from the "threat" of cleaner drinking water and an algae-free Lake Erie. The radio commercials are being broadcast on all the major radio stations in the Toledo area on an almost hourly basis. Thousands of potential voters have heard them already. 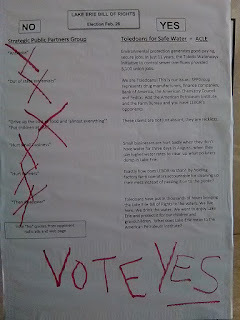 Did these brave activists simply give up in the face of such outright lies and slander? What do you think? "Listening to the radio today while working. 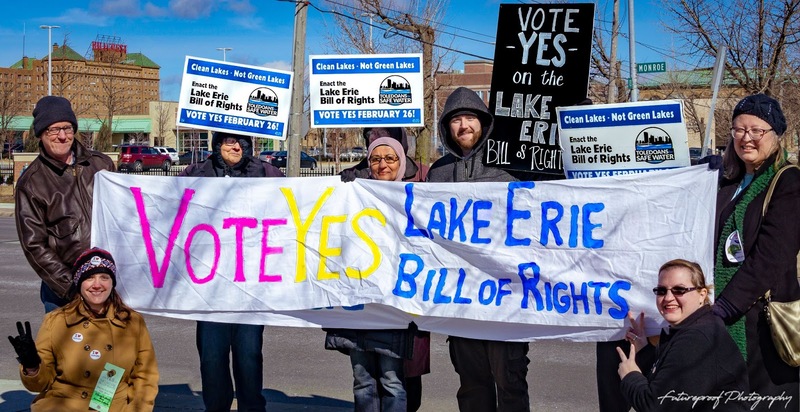 More than one station is running an anti-Lake Erie Bill of Rights commercial today. They angrily proclaim that out of state special interests are trying to put this through to take away jobs, close factories, and ruin the economy. I know for a fact this issue was started locally, and how could anybody be against holding polluters accountable for destroying our water? Oh yeah, those who profit from polluting are. We know the algae problem is caused by pollution. We know the water is not safe to swim in or drink most of the time. Wouldn't it be nice to do something about this now so future generations can enjoy our largest natural resource? Wouldn't it help the local economy if our water wasn't green during the warm season? We have a river/lake that is dying and all you can think about is jobs/money? Wow, unbelievable! Those who pollute our rivers/Lake Erie (or pollute anywhere for that matter) should be ashamed of themselves. Let's take pride in our lake! Vote YES for Lake Erie Bill of Rights." "Funny how all the anti-Lake Erie Bill of Rights ads claim it's out-of-town extremists trying to push this bill. Last I checked, I personally know most of the authors and activists promoting it. Unless they have been lying to me for years about living here, which is highly unlikely seeing as I've been to some of their homes myself, then I can guarantee they are the locals. These ads are dangerous and lying just as much as Trump lies. Do your research and vote in favor of LEBOR this month in the special election. If you have any questions please ask. I have not been working on this campaign but I support it completely. Don't want another episode like in 2014 where we couldn't even shower because the water was so toxic? Vote for LEBOR! I may not know all the answers to your questions but I can direct you to those who do know. The ones putting the negative radio ads out are the actual out-of-towners who are just looking out for corporate interests and not the populations interests. Taking a cue from Trump, they are accusing this bill's authors of that which they are guilty of. #fakenews"
"To 'Real Solutions for Lake Erie' -- Your ad is laughable as if those communities along the lake should vote against their own self interest. Well, I will be voting yes! 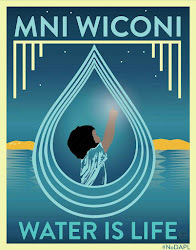 Yes for clean water, yes for our tourism industry, yes for a clean lake no longer polluted from agricultural runoff, farmers whose only goal is profits over clean drinking water. Yes, cities along Lake Erie have been taken advantage of for too long. Well, guess what? Hopefully on February 25 it will end and start a new era for those who live and play on Lake Erie. Yes on the 26th!" 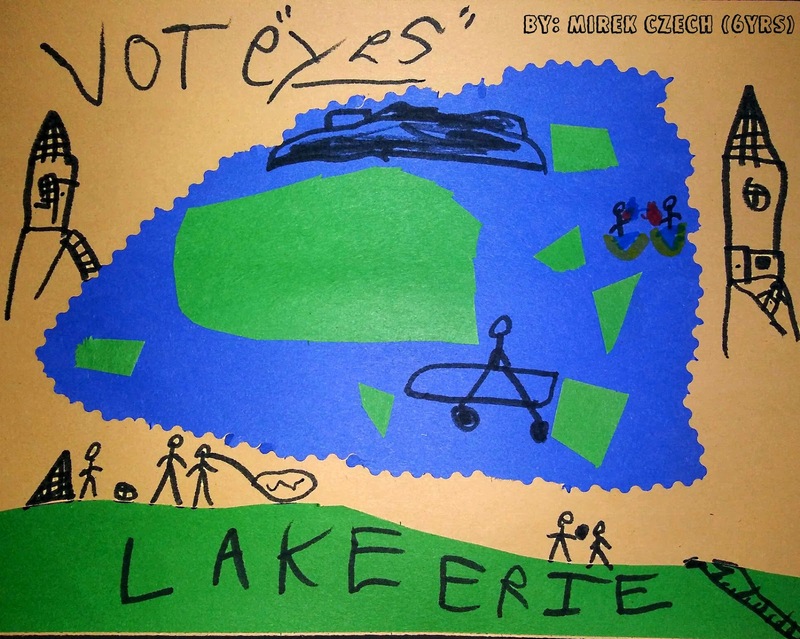 "WHO ALREADY PAYS TO CLEAN UP LAKE ERIE and who's going to? Toledo water and sewer ratepayers have already invested over ONE BILLION DOLLARS to reduce phosphorus and other pollutants that used to go straight into the lake from our treatment plant and combined sewer overflows. When will factory "farms," the Confined Animal Feeding Operations (CAFOs), start paying to treat what they dump -- the equivalent of more than Chicago and Los Angeles' untreated sewage? How much longer will we subsidize their profits by allowing them to use our precious lake as a free public toilet?" 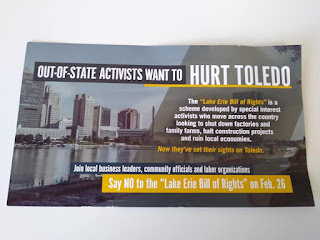 "At least two shadow PACs - "Toledo Coalition for Jobs and Growth" and "Real Solutions for Lake Erie" - were formed in the last week out of nowhere to attack the Lake Erie Bill of RIghts. The former has been airing a series of attack ads on various local radio stations, and the latter is employing a strategy of digital attack ads. The only information we can find about these groups is that a guy named Brandon Lynaugh is the treasurer for one of them. He's a big-money political-hack-for-hire who chose to look like a James Bond villain in his professional head shot. (http://www.sppgrp.com/team/brandon-lynaugh/). He's from upstate New York, and he's airing ads insisting that our activists group is made up of "out-of-town extremists." The irony is palpable. 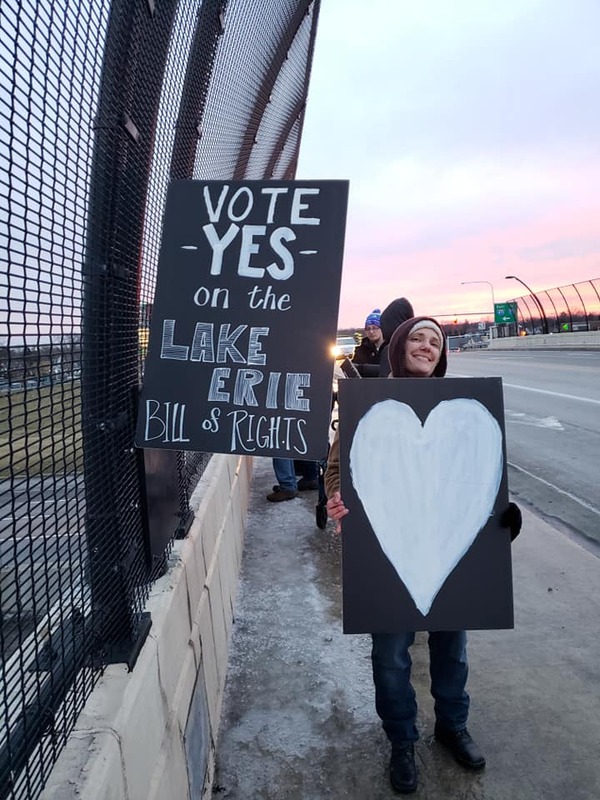 It shouldn't surprise anyone that an innovative effort to protect Lake Erie and hold its polluters accountable is being hit with a well-funded smear campaign full of outright lies. 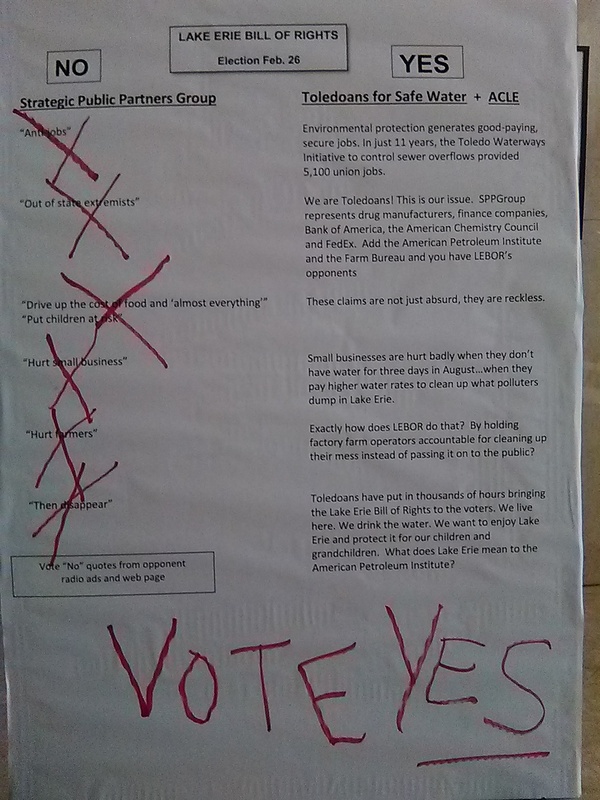 The same people that make money by not cleaning up their mess are paying slick PR firms to convince people to vote against protecting their own water supply. It's beyond time for us as citizens and voters to start questioning what we hear in the media and why. 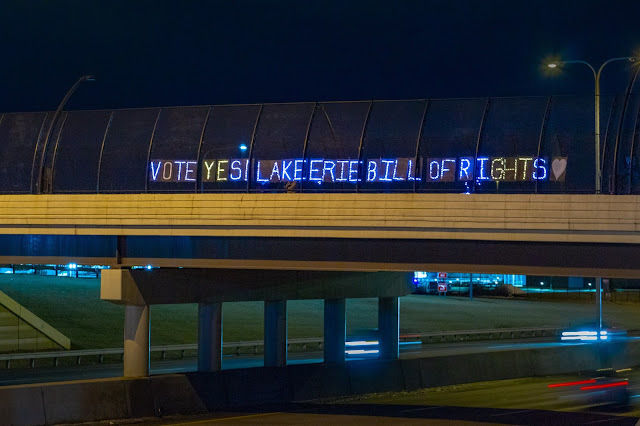 Think about this: if the Lake Erie Bill of Rights is unenforceable or ineffective, as opponents of it have charged - then why is it worth the cost of hiring a slick PR firm and running all these ads to opposite it? If it won't hold up in court - why not just let it pass and challenge it then? A lot of sheltered people take for granted that we have access to clean water. A lot of people have already forgotten the 2014 water crisis. A lot of people are too gullible to think for themselves when they hear an attack ad on the radio. Our drinking water is on the line. 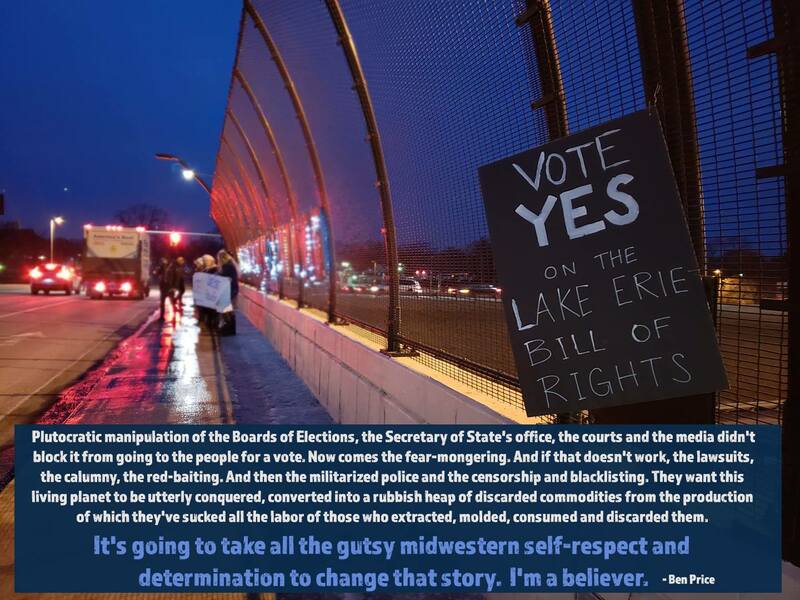 The imperative is to go to the polls this February 26 and vote YES on the Lake Erie Bill Of Rights. Please make sure your friends, family, and coworkers all turn out to vote. We need to send the message to the political hacks of the world that we can't be duped against." "I have been trying to find information on this Real Solutions for Lake Erie - I am assuming it is the exact same as the Toledo Jobs and Growth Coalition, but it helps to have some proof. what I did discover though and again, to no surprise, was the Mahoning Valley Jobs and Growth Coalition filed last year by David Langdon. These two documents are identical, but it might help with anyone you know that is skeptical of us saying this is just industry hiring corporate lawyers to do their dirty work. Just interesting stuff you might wanna look at." 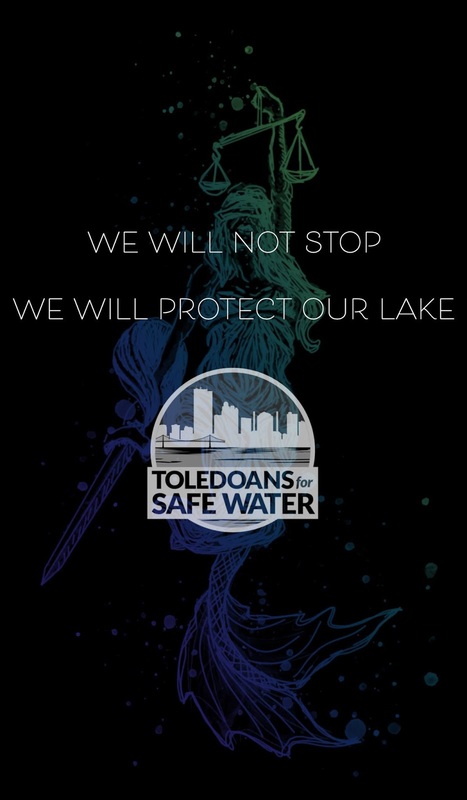 The next week is going to be tough, because the attack ads might migrate to television, newsprint and mailers as well as radio ads and text messages, but the local activists of Toledoans for Safe Water aren't going to stop. 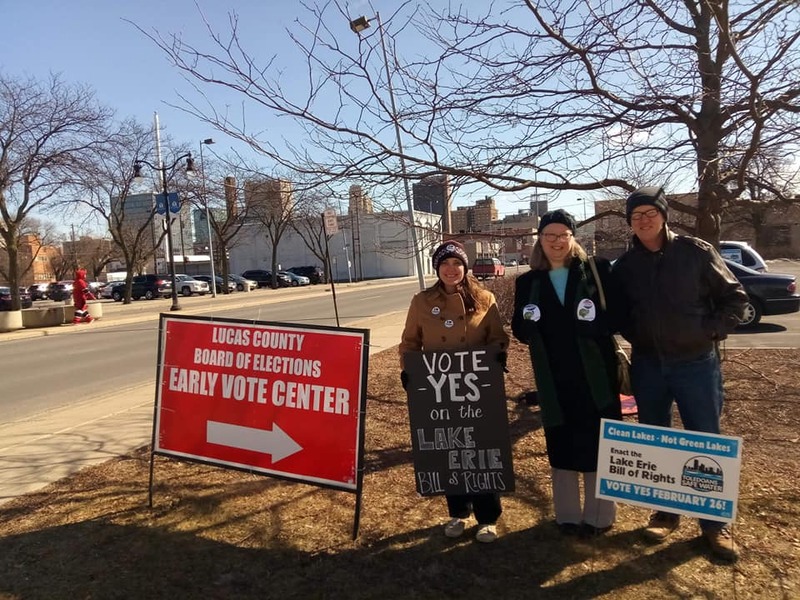 It's been over two years for these fighters working on collecting the 10, 600+ signatures to place this citizens initiative on the ballot, fighting tooth and nail against Toledo City Council and the Lucas County Board of Elections and facing challenges from the Ohio Supreme Court to this day. If these obstacles haven't shut them down, why would a bunch of billionaires hiding behind their lobbyists and PR firms have any chance of doing so? 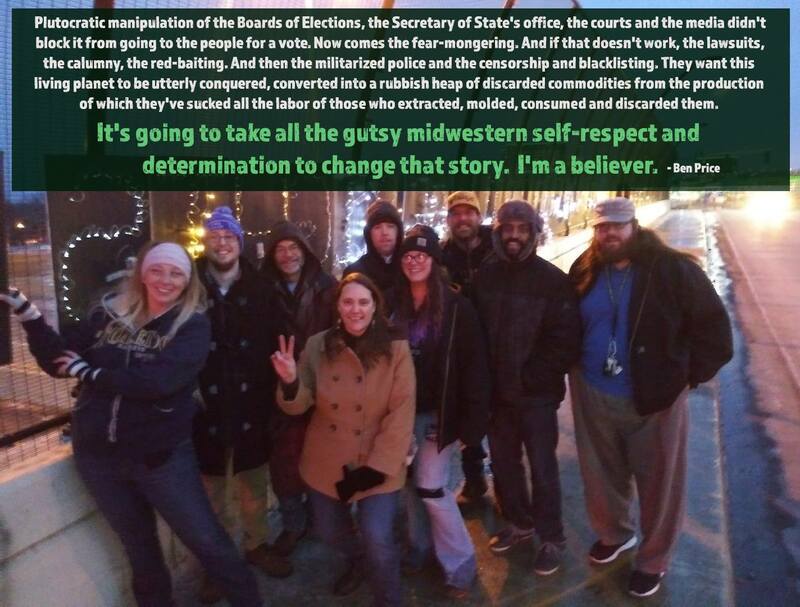 Here's to "gutsy Midwestern self-respect and determination"! Do you care about the Revolution? If so, please help us out! The Revolution Continues has been targeted by anti-progressive trolls and hackers. It's difficult to fight against their blocks to prevent readers from sharing our web site link since these trolls/hackers have access to corporate cash. But you can help us out by donating to keep the blog ad-free and functioning. The editor pays for internet, electricity, etc., out of her own pocket, and she would like to be able to pay her contributors, so your generous monetary gifts are appreciated. Please consider donating a buck, $5, $10 or $20--any amount you can give to keep this progressive site going. Help us become a strong alternative voice protesting against the corrupt establishment and its paid-off corporate mouthpieces. Give to TRC today. Thank you. 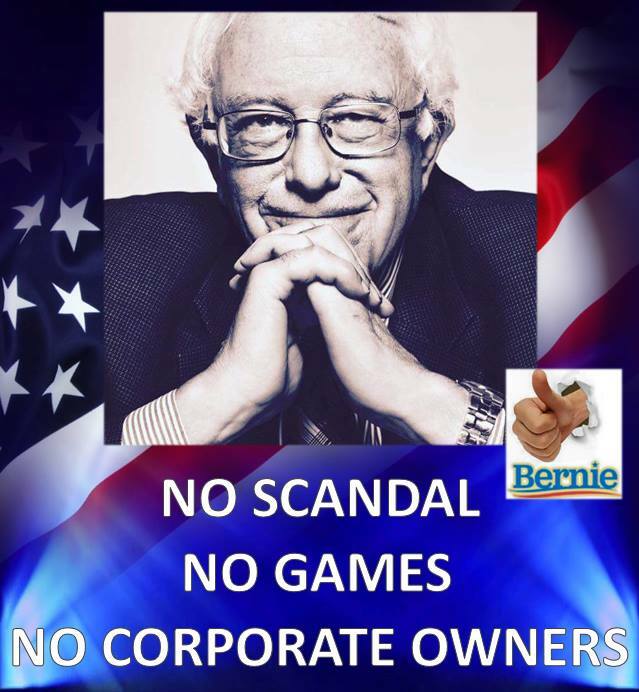 Power to the people--not the corporations! President Trump’s so-called "national emergency" on the border comes as a church and cemetery in Texas is on the verge of being forever cut off from the rest of the United States. Jackson Chapel United Methodist Church in San Juan, Texas is the first Spanish-speaking Protestant church in America. Its origins go back to the 1850s: The property was a stop on the Underground Railroad and the chapel was built by an interracial family whose descendants continue to live nearby. Construction is scheduled to begin next month on 33 miles of wall in the Rio Grande Valley. Customs and Border Patrol has so far ignored neighbors’ attempts to ensure that the wall and accompanying 150-foot enforcement zone don’t cut right through the middle of the church and cemetery grounds - forever separating their family’s gravesites from the rest of the United States. Tell Customs and Border Patrol: Save historic church and cemetery from Trump’s wall. Constant efforts from Friends of the Earth members like you pushed Kroger to phase out its use of bee-toxic pesticides on the garden plants it sells -- but these and other toxic pesticides are still making their way onto Kroger’s shelves in our food. New tests by Friends of the Earth found that Kroger brand breakfast cereal, apples, applesauce and pinto beans contain residues of toxic pesticides linked to a range of serious health and environmental problems. Do you want brain-damaging, cancer-causing or bee-killing pesticides in the food that you or your family eat? I sure do not. Supermarkets like Kroger could take action to make sure the food we buy doesn’t contain these toxic pesticides. But we need your help to convince Kroger to act NOW. That’s why people across the country will be participating in a national action to deliver letters to Kroger stores demanding that it take immediate action to address this issue. We need you to join them! Visit a Kroger-owned store Feb 23rd - Feb 26th: Sign up to deliver a letter to your local store manager asking them to take immediate action! We’ll send you everything you need to visit your local store. Kroger is the largest traditional supermarket in the country. It owns over 3,600 stores. Aside from “Kroger” stores, the retail giant owns the following stores too: Baker’s Supermarkets, City Market, Dillons Food Store, Fry’s Food and Drug, Gerbes Super Markets, Harris Teeter, Jay C Food Stores, King Soopers, Kroger, Owen’s, Pay Less Super Markets, QFC, Ralphs, Pick ‘n Save, Mariano’s Fresh Market, Metro Market, Copps, Scott’s, Smith’s, Fred Meyer, Foods Co. and Ruler Foods. This means that if you have one of these stores in your community, it is owned by Kroger and could be selling food with toxic pesticides too. We found that samples of Kroger brand food tested at an independent lab contained glyphosate, which is linked to cancer, DNA damage, endocrine disruption and is a driver of monarch butterfly decline. We also found Kroger brand food contained organophosphate pesticides, which are associated with reduced IQ, Alzheimer’s, Parkinson’s, cancer, and are extremely toxic to wildlife. We also found neonicotinoids, which are a leading driver of bee decline and associated with hormone disruption. The Trump administration is running the EPA, which means we can’t count on the federal government to get these pesticides out of our food system. We need Kroger to step up and clean up its supply chain! Help save bees and make sure Kroger commits to selling food free of toxic pesticides. Sign up to deliver letters to your local Kroger-owned store Feb 23rd – Feb 26th. Kroger is dragging its feet to act. Last June it pledged to phase out bee-toxic pesticides on the plants that it sells. This is a good first step, but it doesn’t address the toxic pesticides in its food. We can’t let this retail giant off the hook by doing nothing to address the bulk of the products that it sells. We need people across the country to ramp up pressure on this retail giant by demanding that Kroger and all of the stores that it owns immediately commit to stop selling food with toxic pesticides linked to cancer and brain damage. Can we count on your support? Will you help ramp up the pressure? Delivering a letter is fun and easy. Sign up now and we’ll send you a printable letter and step-by-step guide to make your delivery a success.